For more information on any of the services below, please email info@c2ctrees.com. We always prefer to grow your trees from seed we purchase on your behalf. Unfortunately, with 90 seed zones in Alberta, the correct seed is sometimes unavailable for purchase; the only way to source seed for your reclamation project may be to collect it ourselves. The Smoky Lake Forest Nursery Seed Extraction Plant has been extracting seed for more than 35 years. Although the majority of the work done here has been with coniferous stock, more than 100 species have been processed here. Our cleaning plant, also located at Smoky Lake Forest Nursery, is the only one of its kind in Alberta. In the past 35 years, most of Alberta's reforestation seed has be cleaned at this facility. After your seed is cleaned, we undertake additional steps to upgrade it — this improves the number of seedlings we can produce from a given amount of seed. Whenever possible, we like to receive your seed well before we plan to sow it. This allows us determine the germination rate and vigour of the seed. If we determine that you do not have enough seed to meet your order, we can source more on your behalf. We have been growing hardwood rooted cuttings for over 15 years. We produce rooted cuttings for both summer and spring stock. Production of certain species from seed is difficult, or even impossible, and is often more efficient through use of cuttings. When an exact genetic clone is desired, cuttings are often the best option. Examples of species of rooted cuttings we produce include Hybrid Poplar, Dogwood, Willow, Balsam Poplar, and some ornamental species. If you require additional species, our team of savvy growers would be glad to take on the challenge. We offer space for clients to have stooling beds for a variety of species able to reproduce from (cuttings). 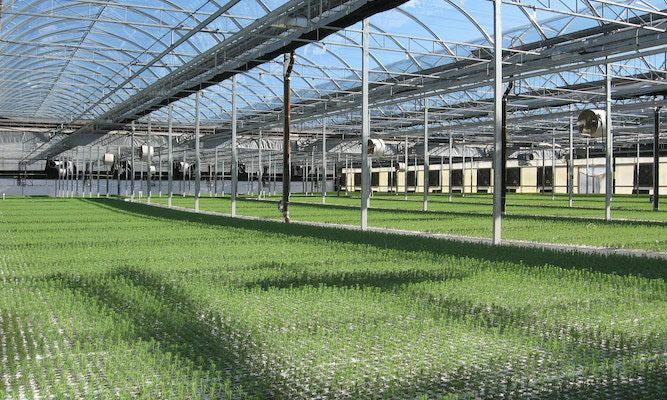 We monitor, harvest, regularly maintain and ensure we produce cuttings quickly and cost-efficiently for your growing orders. Some of the species which can be produced using stooling beds include Willow, Poplar, Hybrid Poplar, etc. If you would like more information or if you are interested in starting a stooling bed at our nurseries, please contact us at info@c2ctrees.com.